From 1997 to 2007, Israel’s CA (Civil Administration) transferred some of the Jahalin Bedouin, against their will, to a permanent site next to the Abu Dis landfill. The CA has since advanced the Jahalin “B” plan, which would transfer the remaining communities, some 2,300 people, to Abu Dis, with plans to put some of the homes as close as as 50 meters from the landfill. Clearly this plan is not acceptable to the Bedouin . It rather seems intended to “free up” the land on which they live for the benefit of the nearby Jewish settlements. Bimkom began a research project along with UN-Habitat and UNRWA. This project examined the Bedouin’s needs and wishes and formulated possible planning solutions. 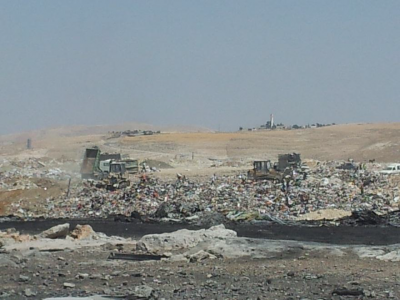 At the same time we conducted an anthropological study of the impact of the transfer of the first group of Jahalin Bedouin to the site near the Abu Dis landfill. The Jahalin B plan had reached the final stage of authorization, but had not been formally approved, due to concern over health issues as well as significant pressure from the international community and NGOs such as Bimkom. It now seems that the plan will not be implemented, however other plans for the forced relocation of the Jahalin, probably to the Jericho area, are being considered by the government. We are already involved in monitoring and responding to such possibilities, and will continue to follow their progress. If necessary, we will submit objections to further plans that do not take the wishes of the Jahalin into account.